When you’re not stepping on them, stingrays can be your buddy. • and my vulcan atomic force-field :). For surf instructors, it’s not a matter of ‘IF’, it’s ‘when’; We’re much more vulnerable than most because of the huge amount of time we spend in the water, walking around where most surfers would jump and paddle, avoiding stingrays. • Any time you’re walking on a sand bottom, SHUFFLE your feet. I would add a little stomp to that, but ONLY (of course) in the area you’ve already cleared and ‘claimed’. This scares them away. Rays don’t want to be stepped on, and in fact, are timid. 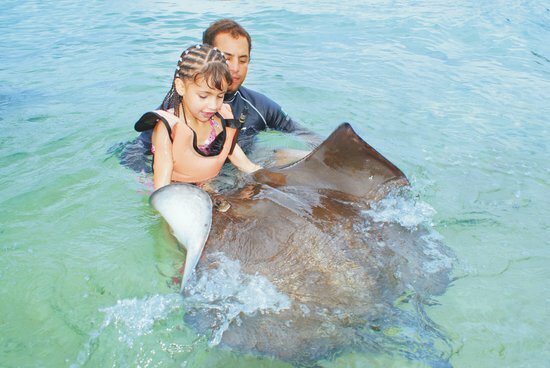 We may be approaching this all wrong: There are areas in the Bahamas where the rays are a tourist attraction; They’re handled, fed, and actually seem to enjoy contact with humans. A stingray injury hurts more than a bee sting, sometimes much more so, but is almost never fatal. Treatment for stingray injury involves hot water, and lots of it. The heat breaks down the protein venom. The hotter the better – generally above 110º F. During the peak summer months, the lifeguard headquarters become ‘social clubs’ full of ‘SRV’s (Sting Ray Victims), seated with their feet in warm buckets, trading stories about the big one that didn’t get away. At Banzai we’ve also treated people by applying mustard, which is a good addition to your beach First Aid kit if there’s a delay getting to hot water. It works; I’ve done some research, and this may have something to do with the turmeric in mustard. (Turmeric is being used is some snake anti-venoms) I’m currently working on a balm that I hope to have ready to test this summer at the nations’ stingray capital, Seal Beach, CA. Meanwhile, do the rays a courtesy and keep shuffling. – Jaz K.
Thanks Banzai and thank you Jaz and Phil, you’re the best! A lifelong dream and a day I won’t ever forget.